Box of installation of lights, which attempts to build installation based on lights deconstructed the ability beyond spectrum of physical medium into the subliminal meta-physical medium of augmented realism. Back in 1940s, a Malayan woman, who defied the Japanese in a war-torn Malaya, and she is none other than Sybil Kathigasu. After reading the book “No Dram No Mercy”, the part which gave me the greatest impact was Sybil’s radio. Sybil kept a radio with nickname Josephine that was kept in a hole under the staircase, which enables her to listen to the British Broadcasting Corporation (BBC) for news and pass on information. Every investment has its risks and likewise, Sybil’s subversive actions reached the ears of Japanese army was labelled as a crime as it helped the Japanese army by providing them information. She was being tortured numerous ways by the Japanese to break her loyalty to the forces and the worst is when she got kicked hard in the face which leads to serious health deterioration. This is all due to her decision to keep the short-wave radio which in short important but dangerous. Deconstruction, according to Jacques Derrida’s “de la grammatologie”, is in the attempt to understand the construction of its narrative, in this case, reading of the book increases the possibility of misunderstanding. This source of information itself has a formation from a set of data arranged as a version in primary mode, which is a speech. Lacking of authenticity in text as compared to a speech in which it comprises interactions through the dialogue, the communication itself. The radio, Josephine, in this case, acts as a leaf of the main motherly figure. Radio misreading in the attempt of listening to radio and sharing information with others are very much related to the deliverable the attempt to deconstruct speech into texts that has been reconstructed way beyond the norm of grammar forming a structure syntactically while maintaining the forms. In attempt to base my work on “deconstruction”, radio misreading is shown by deconstructed text as a remittance of the radio broadcast which was once broken, thus arising the notation of misreading the text that are beyond comprehension. 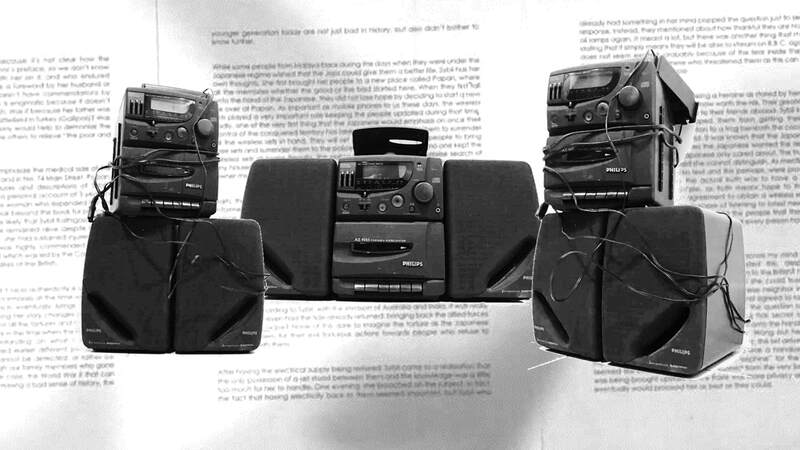 By using a used radio, it gives the idea of how the text was then broken into little parts while the constructed texts tend to show how things can be seen from different perspective based on the understanding of the reader. A used radio, barely functioning, is a desperate source of deconstructed item at that time. The attempt to dissemble the radio shows how fragile it can be yet still plays the role as a transmission medium for important information, that eventually leads to misreading of source. A series of old newsletter about Sybil are pasted all over acting as a source of information, while overlapping with a series of deconstructed text based on my personal understanding. This creates a big impact on radio misreading thus the deconstruction of work.